If I have to pick one thing that I can’t live without this spring/summer, it’d be this linen shirt dress. When I received this linen shirt dress the other day, I couldn’t be happier. Too many reasons to not love this linen shirt dress, the perfect indigo dye, these cute little white buttons, the pockets (anything that has pockets gets plus points), relaxed material and it’s such a versatile shirt dress that can transition into many different occasions. Today, I want to show you girls two day looks and one night look to rock my favorite linen shirt dress. I paired it with a white bag and slip-ons for a casual weekend/day look. With or without the belt it’s great. I personally like wearing it with a belt. White accessories match the cute little white buttons on the shirt dress and they make the look even cuter. This is also a day look. 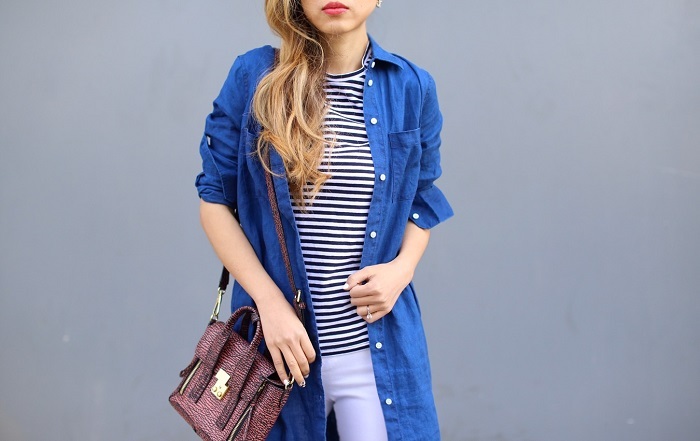 I layered it with this cute stripe tee and wore it as a coat. 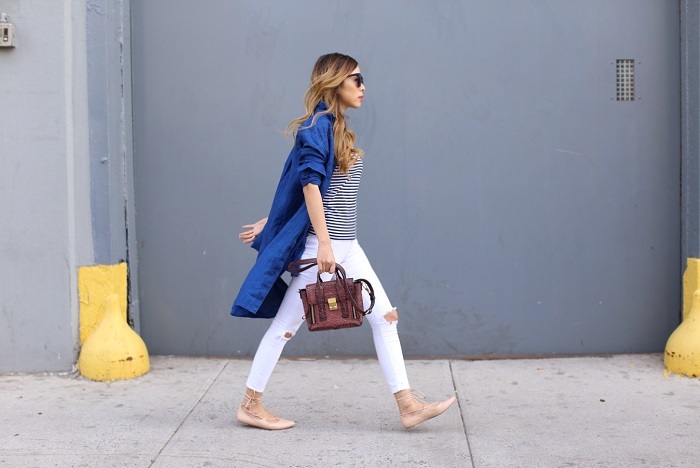 How nice to have a light layered coat for spring! For happy hour, I would roll up the sleeves, tuck in the dress more into the belt so that it looks shorter and then I’d change into my favorite heels. Ta da and I’m ready for happy hour. This linen shirt dress and the stripe tee are from Everlane. They are known for their basics and radical transparency. If you click on the shirt dress and the stripe tee, they tell you the actual cost of making and distributing the shirt dress and tee. They also tell you how much traditional retail sells them for and how much you can get them for from Everlane. You girls can snag the shirt dress for $78 and the tee for only $20. That is so cute! I love how it works as a dress and a layered overshirt!!! Love this great transition! Thank you for the inspiration! That chambray dress is so cute too! So cute love that denim dress!! It's amazing how great you styled it in all 3 outfits!